Great news! Spring is going to be here in no time at all! This means you will finally be able to escape the confines of your home and venture out into the world once again. If you are someone who has already made the fantastic decision to have an irrigation system in your yard, you are going to have to do a little bit of maintenance so that your sprinklers are rearing and ready to go once the warm weather really arrives. There is no need to worry, however. A&C Sprinklers is here to walk you through every aspect of preparing your irrigation system for spring. Continue reading below to get the information you need. If you had your irrigation system winterized before the cold winter arrived, as you should have, you’re going to have to de-winterize it in a manner of speaking. This is done by completing the opposite of a sprinkler blowout. Plain and simple, it requires pumping the air out of your irrigation system, rather than pushing the water out like you do in the fall. We know it can sometimes be difficult to tell when the cold weather is gone for good, but we would recommend that you try your best to do so. If you live in the northern part of New Jersey, you might find that you have to wait a bit longer than you would like to reinstate your sprinkler system. We would recommend not doing this on your own, however. Sure, you are more than capable, but if you want to ensure that your sprinkler system gets started on the right foot, and at the right time of the season, we would recommend hiring a professional. As lawn care experts, we can make sure that the water isn’t turned on too quickly, as well as make sure that that the time and all of the stations are on the right settings. Additionally, we can check for leaks and make sure that any and all debris is flushed out of the system making it ready to work when you need it to. It isn’t uncommon for sprinkler heads to become damaged or get clogged during the winter. In order for your system to be ready to go in spring, all heads need to be checked and replaced before you begin watering your lawn. In order to clean out a sprinkler head that is clogged, pop up the riser of the sprinkler head, unscrew, and remove the filter. You will be able to tell if there is anything clogging the head at that time. Remove the debris and rinse the sprinkler. Don’t Have A Sprinkler System Yet? If you don’t have an irrigation system already installed in your yard, it’s absolutely time to start thinking about getting one. 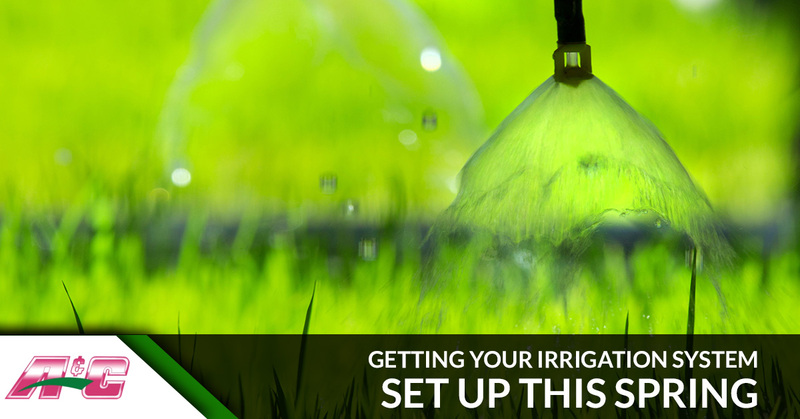 Before you make the call, however, here are a few things you should make sure to consult your irrigation specialist about. There are a couple of different types of irrigation and sprinklers that are used most commonly. In order to know which type is best for your lawn, we would recommend that you consult with an irrigation specialist. It is most likely that you will be recommended drip irrigation or hose-end sprinkling. The last thing you would ever want to happen to your lawn is for it to flood. This is why it’s so important that you have proper drainage in your yard. This is a job that is especially meant for an irrigation specialist. If you want to ensure that everything goes swimmingly with your sprinkler installation and that you won’t be swimming in your lawn come spring, you need to call the professionals at A&C Sprinklers today.